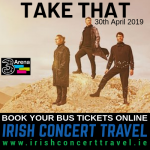 The concert/ festival/ event being cancelled within 24 hours of the departure time of the origin of the service route, but 2 hours prior to this departure time, Irish Concert Travel will make a refund equal to the fare paid minus an administration fee of 10.00EUR per seat booked. 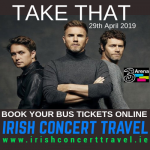 The concert/ festival/ event being cancelled within 2hours of the departure time of the origin of the service route, Irish Concert Travel will make a refund equal to the fare paid minus a coach hire reservation and administration fee of 10.00EUR per seat booked. The concert/ festival/ event being cancelled is rescheduled to another date. 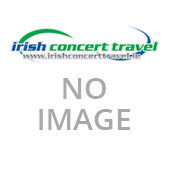 (Should the rescheduled date not suit the customer, Irish Concert Travel will make a refund equal to the fare paid minus an administration fee of 10.00EUR per seat booked).